ESRI has created a set of map templates that local governments can use to tackle the Opioid Epidemic and other public health issues. They are shown on this page. This same set of tools, or ones similar to it, could be used to identify existing non-school tutor/mentor programs in a geographic region and draw support to each of them. That's what Tutor/Mentor Connection has been trying to do with GIS maps since 1994. I've never had the talent and resources that companies like ESRI have to do this work. Since 2013 I've participated in several on-line events and some have used Google maps to show participant locations. I started creating maps to show participation in Tutor/Mentor Conferences in the mid 2000s. 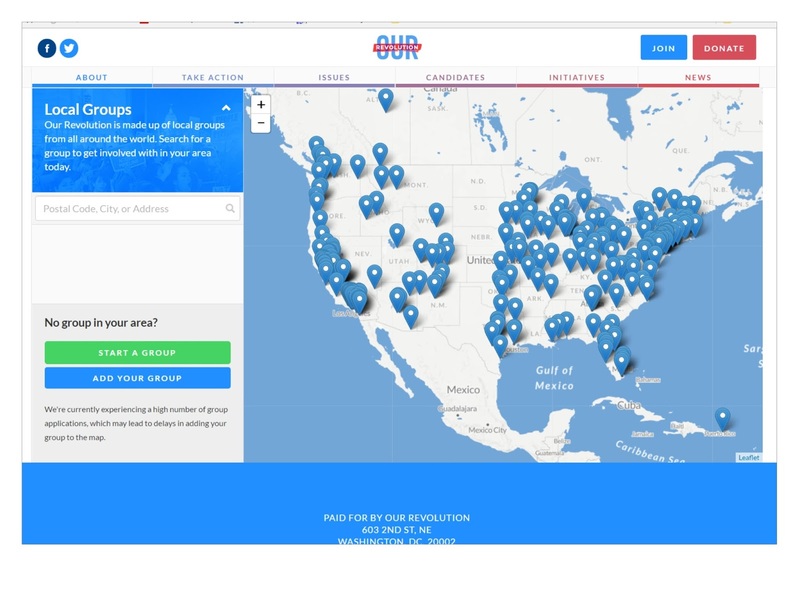 Thus, I was pleased to find this interactive map on the Our Revolution political organizing web site. You can zoom into the map, to the zip code level, and click on the icons to find out what group this represents and how to get connected. I've posted articles about the #onthetable event hosted the past four years by the Chicago Community Trust and suggested that they create a map like this to show people hosting their informal meetings and another to show locations of participants, as part of an evaluation process and also as part of an organizing effort intended, as Our Revolution does, to keep people working with each other to understand and solve problems important to the Chicago region, or the nation. If you've examples of maps being used this way feel free to post a link in the comment section. 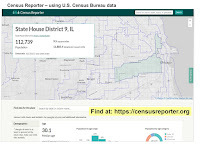 This is a screen shot from a page on the ChicagoReporter.org web site, which makes U.S. Census Bureau data easily available. 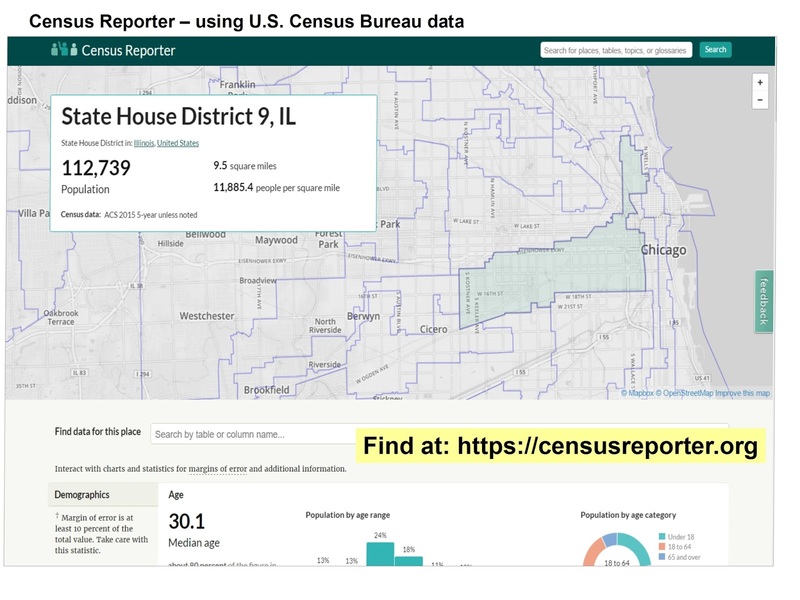 This was just one of many resources that I learned about during last night's Chicago City Data User Group (#CCDUG) meeting at the Microsoft headquarters in Chicago. Other resources were shared by participants in the MeetUP, using the #CCDUG hashtag. Browse this thread and you can find more links. I posted to Twitter my own long-term vision of sharing map-based data with this type of sophistication. 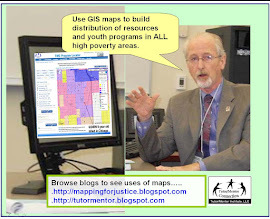 Below is a pdf created in 2009 to show how to use the Tutor/Mentor Program Locator to create map stories. The program locator is now out of date and needs updating. Imagine what I could do if I had the talent and resources to apply some of the mapping tools shown above to the work I've been trying to do since 1993. If you can imagine this, and you understand the need and opportunity, and you have either the talent or the dollars, why don't you reach out and offer your help? This can apply to any city in the world, so you can be located in any city and work with me via Skype or other on-line tools. Let's connect.